OxyContin is a highly addictive prescription painkiller, and has become one of the most frequently abused narcotic pain medications. 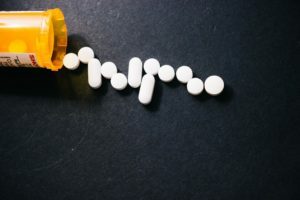 Whether the addict has developed a dependence from a prescription or obtained the drug through illegal means, abusing OxyContin or other prescription painkillers can have devastating side effects. Opioids attach proteins to opioid receptors found in the brain, spinal cord, gastrointestinal tract, etc. This reduces the perception of pain in the brain. It also increases dopamine levels in the brain, leading to a slightly euphoric feeling. Users of oxyContin tend to feel sedated, sleepy, light headed, and euphoric. Negative side effects can include : constipation, itching, constricted pupils, respiratory depression, apnea, respiratory arrest, circulatory depression, hypotension (low blood pressure), shock, and death. The most common cause of death resulting from OxyContin overdose is from respiratory depression. Oxycontin addiction is similar to a heroin addiction. It produces strong cravings, tolerance over time, deterioration of moral values (such as honesty, care for self and family, importance of a career, etc), and serious withdrawal symptoms. Some withdrawal symptoms include : vomiting, nausea, muscle and bone pain, depression, and cravings. You cannot simply detox from the drug, you must also detox from the lifestyle. OxyContin is taken orally, in 10, 15, 20, 30, 40, 60, 80, and 160 mg tablets. Some people will start injecting, snorting, or chewing the tablets in attempts to release the drug more rapidly. However, that can cause the drug to release too rapidly and the high concentration of OxyContin in the bloodstream can lead to death. Initially, there are circumstantial clues that may indicate that someone is abusing prescription drugs. Emotional instability is very common; drug use can cause symptoms similar to depression or other emotional disorders. Between doses, the person can become anxious and angry. They may become irritable and turn to lying and deception to obtain more of the drug. Many people who become addicted to OxyContin begin to “shop” for doctors, constantly changing doctors and faking illnesses and injuries in order to obtain prescriptions for OxyContin. They may also attempt to purchase prescription medication online or steal medication from friends or neighbors. OxyContin users generally build up a tolerance to the drug, needing more and more to satisfy their cravings. As the demand for the drug increases, so does the need to finance their habit. People who are addicted to OxyContin may frequently ask for money or steal it from friends and loved ones. Many individuals will steal or forge signatures on prescription pads or checks in order to obtain more drugs. An addict under the influence of OxyContin may disassociate with their feelings or friends. Their general outlook will be that of an “I don’t care” attitude. Because of the effects of the drug on their bodies, users may find themselves frequently confused. They may also lose interest in previously enjoyed activities. Their motivational level decreases and they may miss work or school more frequently or hear complaints from teachers or co-workers about a decrease in their performance and demeanor. One of the most noticeable signs of OxyContin use is a change in a user’s eyes. Their pupils may be constricted, resembling little pinpoints. They may also appear bloodshot due to a change in sleeping patterns. Because of the strength of the medication, people who are addicted always appear tired. Other signs include general weakness, seizures, nausea and vomiting. ReAlign Detox is dedicated to helping people in Southern California detox from dangerous prescription opioids that they have abused. Our clinical team works 24/7 for patients to restore their physical health and kick a dependency to substances like OxyContin and other opioids. If you or someone you know suffers from chronic OxyContin addiction, please give our team a call, today!